On June 30, Congalton was walking to the “Families Together March” when a vehicle crashed into him at the intersection of Marsh and Chorro streets, leaving him with serious leg and head injuries. Congalton underwent surgery to repair a busted kneecap and spent multiple weeks at a rehab center and in home health care. Congalton, who said he has no memory of the collision, was off the air for nearly a month. Congalton filed suit on Friday against Nicholas Franklin Silva. He is seeking more than $25,000 for damages, medical expenses and loss of wages. 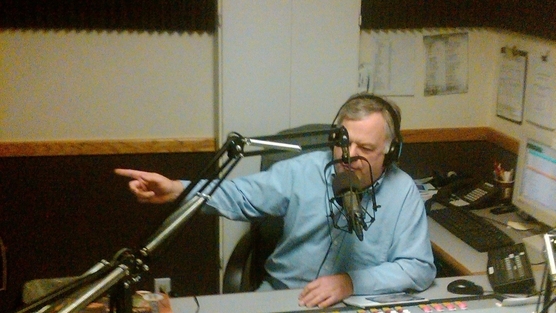 For nearly three decades, Congalton has hosted “Hometown Radio with Dave Congalton” on 920 AM. What a tough year it has been for Dave c. Better times ahead! Just happy to hear his voice again. Miss him when he is gone. Accidents happen but costs of them must be covered. Its just the way it is. Costs should be covered by the responsible party. The police report should inictate who’s at fault. IF it’s the driver, good for Dave for not taking him to the cleaners. On the other hand, if it wasn’t the fault of the driver then he should not be responsible for someone else’s mistake. He was not in a crosswalk. A hospital stay, surgery, and rehab is not cheap. Why sue the guy for only $25K? Attorneys charge 33-40% and would take this case in a heartbeat IF the driver were at fault. This makes no sense, unless a quick settlement is the goal. Per the article, “He is seeking more than $25,000 for damages, medical expenses and loss of wages.”. This means Congalton filed an unlimited civil case. A limited civil case would be seeking damages between $10,000 and $25,000. How kind of him if it’s his fault? Thanks for the clarification, but that doesn’t mean it’s excessive or that it’s anything more than what I stated. Medical bills have tendency to multiply as these types of injuries are usually subject to relatively long healing times, secondary surgeries with physical therapy that can stretch out for months. Loss of wages is pretty cut and dry, the only thing that appears open ended is the “damages”., and from what I’ve read, and experienced, is very seldom awarded. In this case, and I’m no lawyer (have sued pro-se successfully though) it would seem a determination of malice, “… conduct intended to cause the plaintiff injury or conduct that is carried out with a willful and conscious disregard of other people’s rights and/or safety.” would have to be reached. Maybe Dave and his attorney(s) know something we don’t, something not being reported, who knows? Seems fair, I thought for sure he would asking a lot more than that.